Establishing an effective Environment Management strategy is key for utilizing the Salesforce1 platform. Here is an environment management strategy that can be emulated on many Enterprise projects. Establishing an effective Environment Management strategy is critical for utilizing the Salesforce1 Platform. Salesforce.com has already established itself as a leader in cloud technology and innovation, however some aspects of dealing with the platform still require good-old-fashioned IT management skills. Salesforce provides a LOT of content around governance, environment management, and change management. However I have noticed at multiple clients the information and options are sometimes too plentiful. Many customers want to be given a recipe and a framework as opposed to designing their own solutions from best practices. 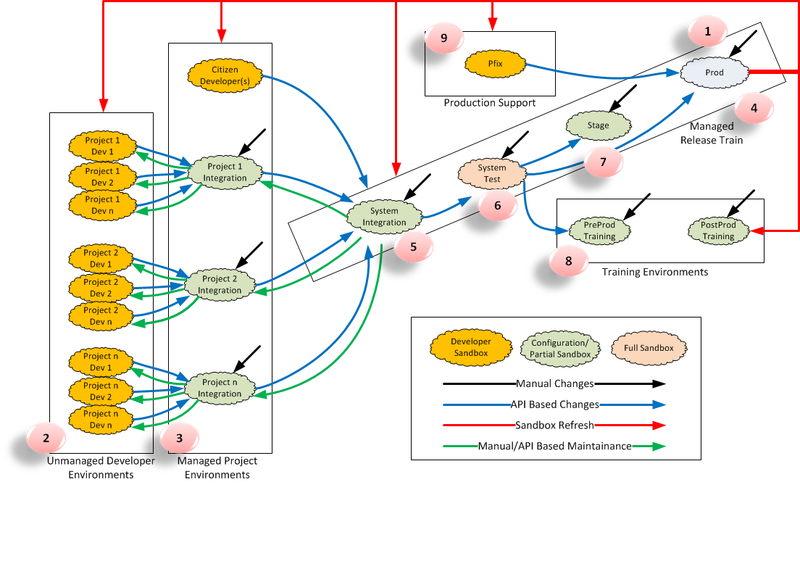 This installment describes a typical environment management strategy that can be emulated on many Enterprise projects. The first thing to understand about environment management on the Salesforce1 Platform are some of the differences to typical environment management. Environment management is one of the most difficult and under-realized aspects on enterprise projects. Companies often under estimate the amount of work necessary to orchestrate the movement of data and metadata throughout the environments. The right strategy, the correct resources (human and technical), and effective processes can radically accelerate and improve your consumption of the Salesforce1 Platform. You can harness the agility of Salesforce with the predictability of enterprise class deployments. If you are looking for help on getting started, consider obtaining the help of a Salesforce.com Certified Technical Architect to help your company define and execute upon an Environment Management strategy.